Red Tiger gaming have provided online-slot machines to the market since 2014 and provide high quality gaming to players in both Europe and Asia. They are well known for their iconic branding which encompasses the strong head of a red tiger! Look out for their games across a range of online gaming platforms and casinos. What makes their content so appealing is the fact that they specialise in developing high quality slot games to play online – aiming to create iconic and creative themes for their players. Esqueleto Mariachi is no exception! If you're looking for slot bonuses, you've came to the right site. Click the link and take a look. There are 12 different symbols which reflect the culture embraced in this online slot game. These include a Mariachi girl wearing a skeleton mask (she also acts as the wild card). 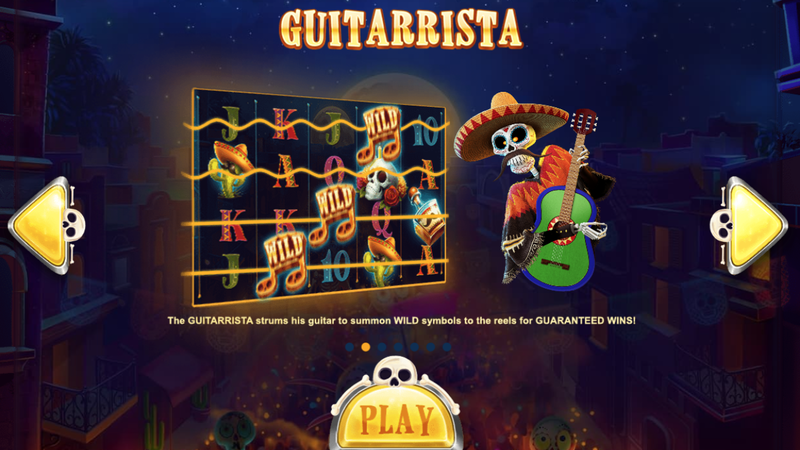 Additionally, there are skeleton musicians – meet Guitarrista, Trompetista and Maraquero. You will also find more skulls, cactuses wearing moustaches, a sombrero and a liquor bottle. The paytable is finalised through 5 playing card symbols A-10. You will want to see the musician symbols the most though because they unlock special features, known a Mariachi Spins. 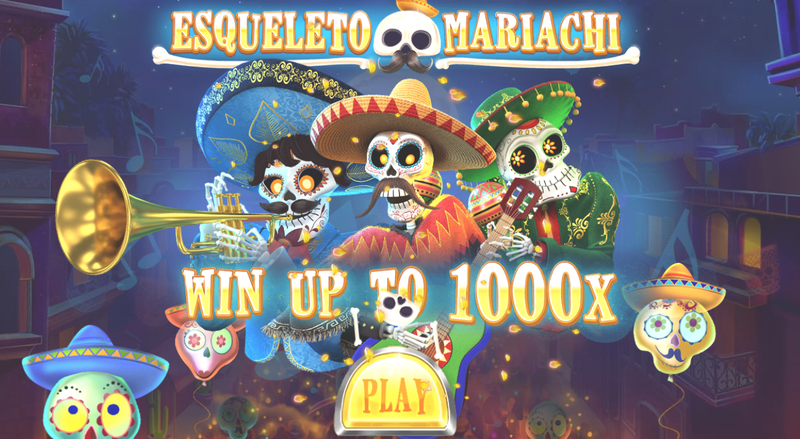 You will need to collect 3 Mariachi Spins symbols on the reels and a random amount of free spins will be rewarded. Throughout these spins, one of the musicians is guaranteed at least once which will provide rewards! For example, the Guitarrista will turn lots of symbols into wilds; Trompetista will push away some non-rewarding symbols and Maraquero will shake it up to bring in new additional symbols. The wild card (Mariachi girl) can reward up to 500 x your original bet and this is the highest rewarding symbol in the game. 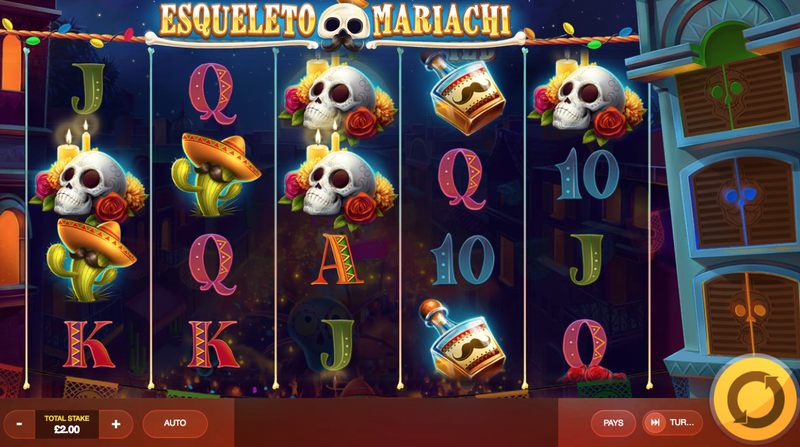 The Mariachi Skull will give you up to 300 times your bet, for the same 5-of-a-kind combo, whilst the Liquor bottle and the Mexican Cactus will pay you up to 200 and 140 times respectively. The skeleton musicians are not paying symbols, unfortunately, but however you can receive very profitable consolations from the playing card symbols – A, K, Q, J, 10 – as they will give you up to 72, 48, 40, 32 and 20 times your bet respectively. This game is enchanting through powerful imagery and theming which engrosses players to engage with the iconic symbols. If you enjoyed this slot, read more to find other fantastic new casino games!